This is my first foray into South Indian food on the blog, Kerala to be more specific. My first introduction to South Indian food was the marvelous masala dosa while on holiday in Delhi as a child. There was a travelling dosa-walla who would wheel his cart down the street behind my maasi’s house most evenings, calling out to us and tempting us all with the wonderful smells wafting off his cart (so much more exciting than an ice-cream van, even on a hot day), resistance was futile. While the sambar was simmering gently and the potato masala was kept warm on little gas stoves on the cart, he would make the thinnest and crispest dosas on a large cast iron tava with such speed and dexterity that we enjoyed watching the process almost as much as we did eating the dosas. I have tried making dosas with little success and I have much admiration for those who get it right, it takes a lot of practice to spread out the lentil and rice batter in quick and accurate enough circular motions to get a very large, thin and crispy pancake that holds together. I lived in Delhi between 2005 and 2006 while carrying out the fieldwork for my PhD, and I visited this excellent South Indian restaurant called Sarvana Bhavan in Connought Place, recommended by my South Indian brother-in-law, at least once a week at lunch time. The place was always so busy and you didn’t see many women dining on their own, especially Indian girls; I was often the only one. The slight awkwardness passed after the first couple of visits; nothing was going to keep me from their delicious thalis, idlis, dosas and gulab jamuns. Since then, I’ve had all sorts of South Indian food in most of the places I’ve lived in, but nowhere more than London. I lived 10 minutes away from the Tooting Broadway and there were at least 10 South Indian restaurants on a 1km stretch of high street. They even have dosas at the food court in Selfridges in Central London, possibly the most expensive and least impressive ones I’ve tried. In Mombasa, where I live now, we have the excellent Bollywood Bites, offering both South and North Indian fare under one roof as well as near life size murals of Bollywood actors on the walls. I have never been to South India but I look forward to it very much. There is so much more to South Indian food than dosas, idli, coconut chutney and potato bondas. I became more interested in how they prepared other vegetables and someone recommended Ammini Ramachandran’s Grains Greens and Grated Coconuts, a vegetarian cookbook specialising in the food of Kerala. It’s a wonderfully intense read in which the author educates us about the history and culinary traditions of Kerala, much of it through personal memoir. I have tried her dosa, idli and oothapam recipes with much success (notwithstanding my own lack of skill in making the dosa) but my favourite recipes so far are the yogurt or curd rice and the thorans, or stir fried vegetables. 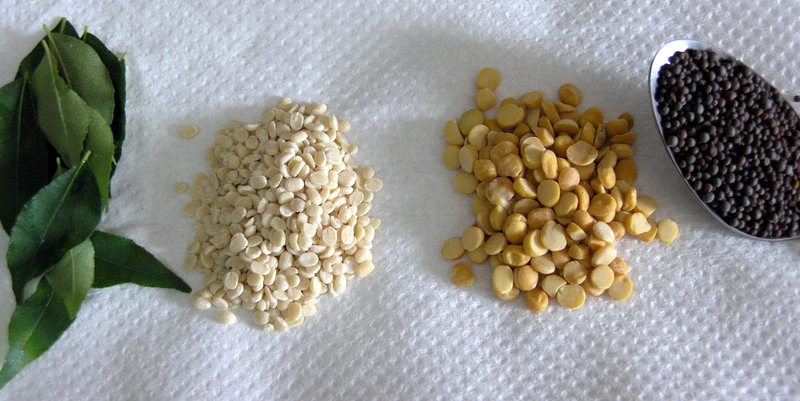 Curry leaves, split lentils, mustard seeds, and dried chillies are key ingredients in the tempering of most vegetable, lentil and rice dishes in Keralan food. Fresh grated coconut is also often added. Powdered spices like cumin, coriander and garam masala are rarely if ever used. The result is more subtle and gentle flavours and varying textures, like the crispness of the curry leaves and the satisfying crunch provided by the split lentils alongside the relative softness of the rice or vegetables. It’s light, fresh and tasty. I adapted the green beans thoran recipe from the book for a delicious beetroot version and added a twist or two of my own to add a little more punch. I did not precook the beetroot as I wanted a crisper texture, but you may prefer to, in which case boil the whole unpeeled beetroot for 35-40 minutes or pressure cook for 10-15 minutes. You can also buy precooked versions in most supermarkets. 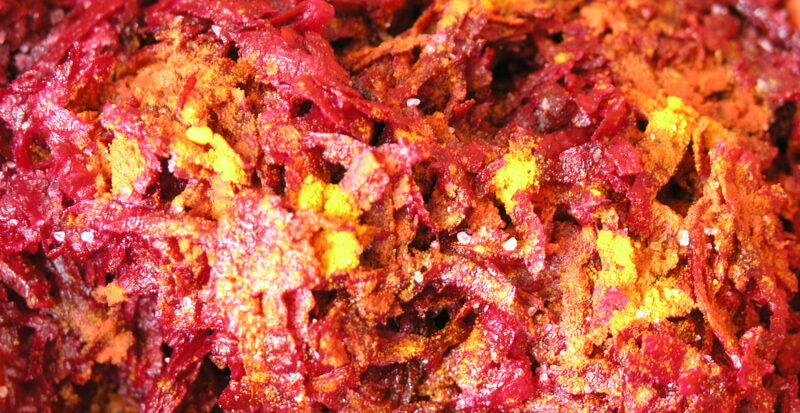 Combine the grated beetroot, salt and turmeric well and put it aside. Heat the oil on medium heat in a non-stick wok or heavy skillet. Add the mustard seeds. 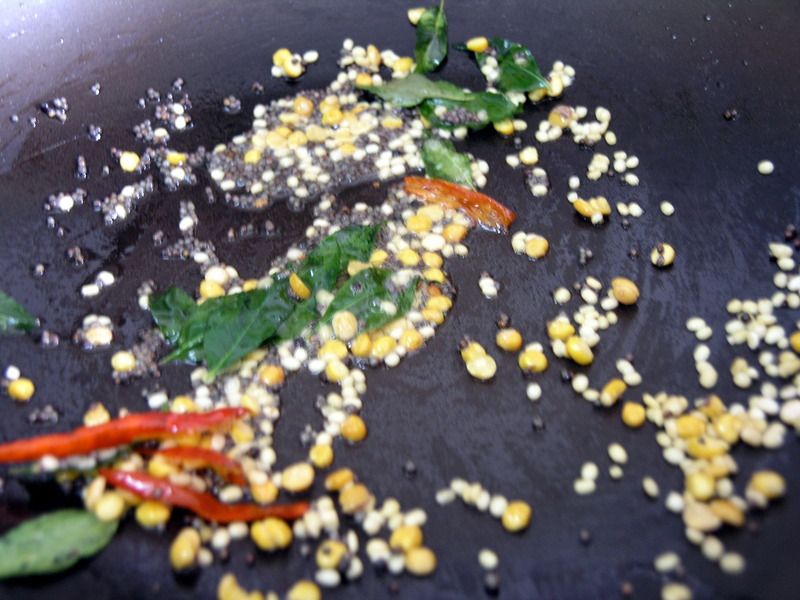 When the mustard seeds start to pop, add the urad dal, chana dal, curry leaves, and red chilli. Fry until the dals start to turn golden brown (this way they will be crisp and easier to eat). Awaiting the gloriously purple beetroot. Add the beetroot, turn the heat down slightly and let the beetroot cook, covered, for 6-8 minutes, stirring from time to time. Add the balsamic vinegar or lemon juice, grated coconut and green chillies. Give it a final taste and adjust seasoning. 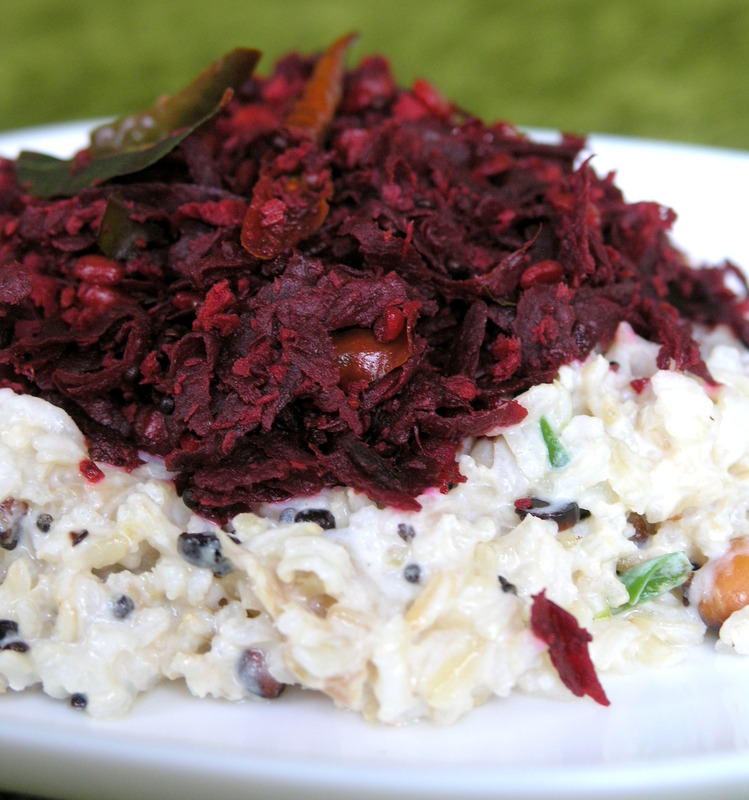 Serve with either plain rice, a pilaf or with this delicious yogurt rice. This recipe is off to Ricki’s Wellness Weekend May 24th-28th. i love beet Thoran style. makes it so much easier to add more beet to the daily meal! We launched http://www.veganchutney.com/ , a photo gallery site for Indian vegan food. Do drop by to submit your recipes. It is difficult to find recipes for special diets and hopefully the gallery will be useful! Thank you so much Richa. Your own website is just aspirational – I love everything about it. I will be posting on veganchutney regularly from now on, thanks for letting me know about it. 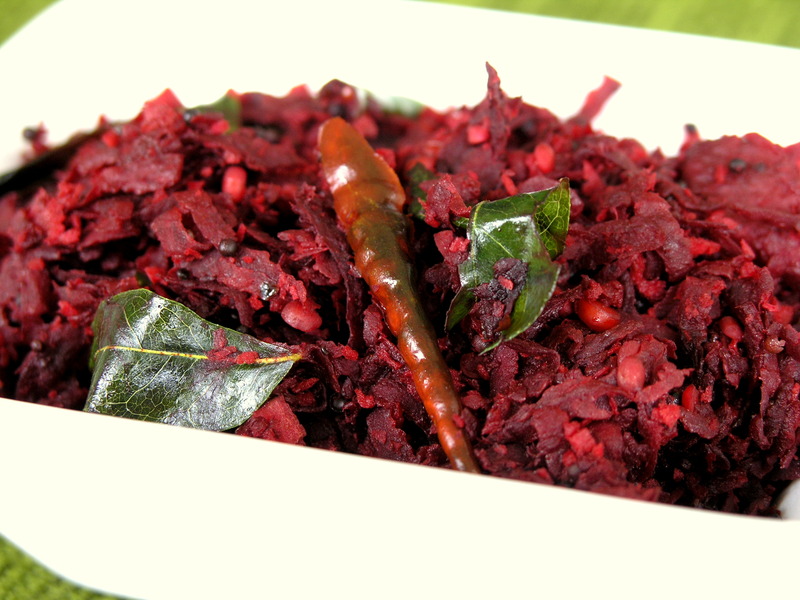 For people who don’t like beetroot, I highly suggest you give this recipe a go, you’ll love the South Indian flavors. For people who like beetroot, as I, I bet you’ve never had it prepared this way! It was truly delicious and a really unique way of preparing it. Thanks so much Ron, I loved the South Indian flavours with the beetroot – simple and clean – this will be a regular meal for me.